Many people know the problem: You still have an older but good case, but there is a lack of space for hard drives. Well, some cases were even then very expensive and maybe you do not really want a new case. So what can you do if you want to install more hard drives while you don't need a big number of 5 DVD or Bluray Drives? Maybe a backplane with removeable frames could help you. 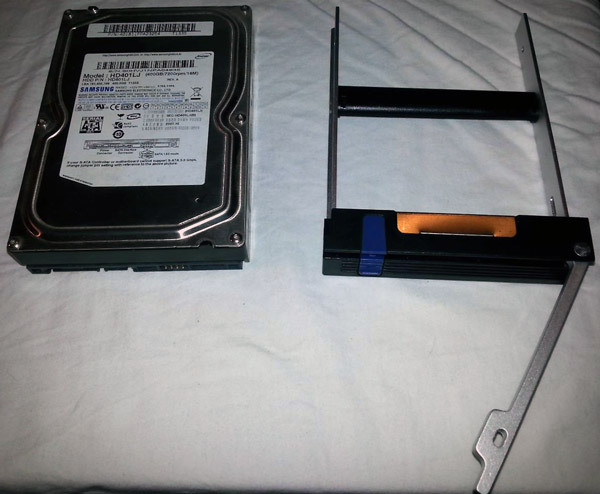 The advantages are clear: you can remove every single HDD for example when they're broken or when you use a HDD only for backup you can eject it from the running system. That saves energy and the HDD (hopefully) lives longer. Other benefits would include that each drive has its own status LED. So you know immediately each disk with traffic. 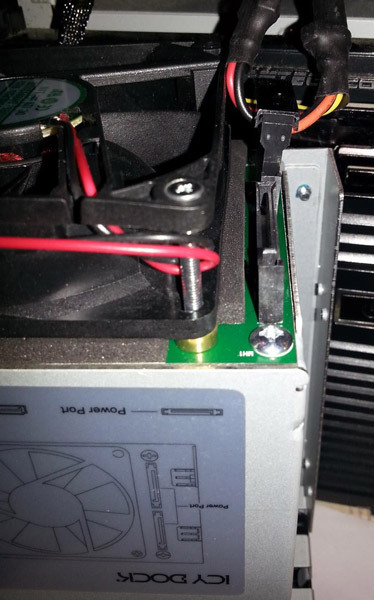 If you use RAID systems, in the case of a defect, you can replace the HDD on the fly without shutting down the system. 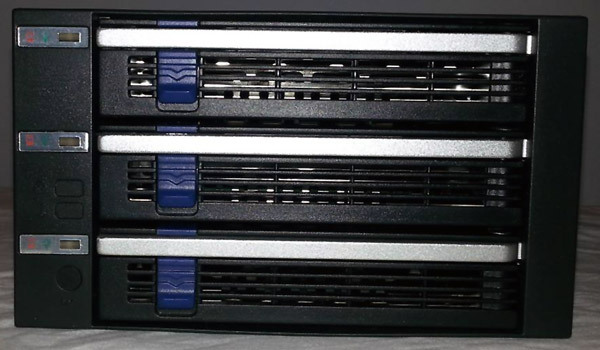 Advantages that exist in the server segment for a long time and in the days of cheap HDDs are very interesting, even for home users, especially when you want to build up an own home server. 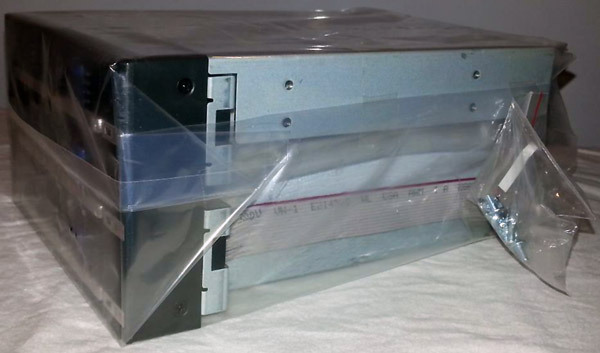 Cremax has a cheap "3-in-2 SATA internal RAID backplane for 3.5-inch SATA hard drives" for about 60 EUR on the market. We have a closer look on the Icy Dock MB153SP-B. Thanks to Cremax Tech Ltd. for kindly providing a test sample. It was delieverd in a brown, nondescript box. 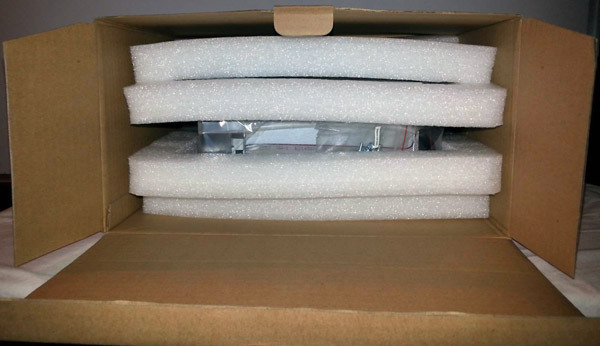 This is the well-padded removable frame, which is also called backplane. The caddy itself is again well packed in a foil so that no moisture can enter the unit. To keep the humidity low within the foil, also a packet of granules are packed in the caddy. At the foil itself are two small sachets with 8* M3x6 screws (to place the backplane into the case) and 6* 32 countersunk screws for the HDD-carriers attached. This number of screws for thee disks appears to be very low, but later more. Furthermore, a "Quick Installation Guide" is attached. It has a very good translation in German and is not like using online translators. The only drawback is that there the pin assignment of the 12 pins that are present on the board is indeed names ("Access 1-3" and "Mated 1-3"), but is not precisely addressed the function. On the Internet and on the manufacturing site, no further information was available. Most likely, these are for external LED terminals. The Backplane bringt about 912 g on the scale and the plastic fron is predominantly in black. Colorul accents rely the gray lever and the blue eject button. The dimensions are 146.4 x 200.4 x 85.8 mm (L x W x H). Here you have to make sure that if does not come to a collision with a very long graphicscard. For example a HD4870 1GB with its nearly 28 cm barely fits.But there may also be some problems with thick cables if the case does not have appropriate opportunities to move this elsewhere. 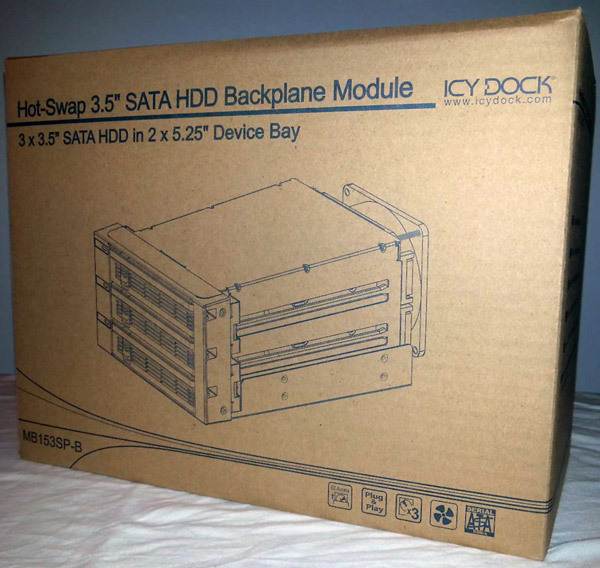 The ICY Dock MB153SP-B backplane has three bays for 3.5" S-ATA I/II/III HDDs and uses two 5.25" bays. For 2.5" drives you can buy separately an "EZConvert" by ICY Dock. 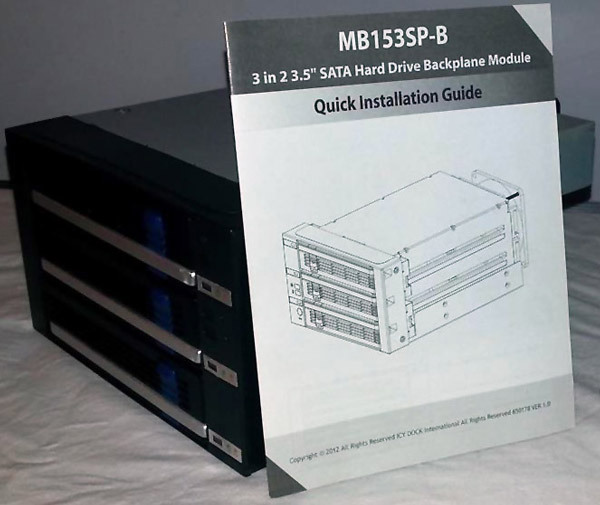 The backplane supports hard drives up to 4 TB and functions offered by S-ATA (Hot Swap, Plug & Play, SMART). The compatibility of the backplane to other products from ICY Dock of the series MB45x, MB559, MB562 and MB876 and the fact that you can buy a single HDD-Carrier for about 15 EUR is a great advantage. The MB153SP-B is in principle the "cheap version" of MB453SPF-B, but it has no alarmsystems for temperature, fan and HDD failures. Nevertheless, there are in addition to the status-LEd for ech drive the so-called "Active Power Technology (APT)", which ensures that the individual LEDs and the fan are only active when HDDs are used. The warranty is 3 years. The backplane is well done, there are no sharp edges and thus there is no risk of injury. Nothing rattles and nothing seems to be cheap in any way. It fits exactly in the form of the 5.25" drive bays and leaves no excessive gaps. Although ICY Dock advertises to develop screwless design, you have to use screws to attach the HDDs to the carriers, although this is not a disadvantage, since the sense of it is to place the HDDs in the carrier. The HDDs are connected the the bolts supplied with the HDD carrier. But you have to use the screws of the center bar of every frame, because the 6 provided screws are not enough. 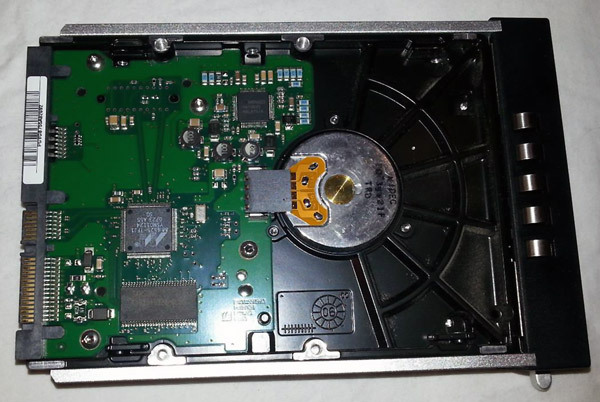 The center bar is usefull, because the empty hard disk frame has sufficient stability and must be removed before installation of HDDs. Although the disks are not decoupled particularly, no great vibrations in the case will be forwareded if more than two HDDs are installed. With only one HDD installed, it is possible that vibrations are transmitted to the housing. The disadvantage is, if you remove a rarely used HDD from the caddy, there "gapes" then a hole. This is not very nice and dust may come inside. This problem can be solved by using an additional caddy, which you can use as "dummy". But you have to pay about 15 EUR. The caddy needs for the three HDDs only two S-ATA 15-Pin power connectors and uses as transmission standard "S-ATA 6GB/s". S-ATA power connectors were chosen according ICY Dock "because of the compatibility with new power supplies". 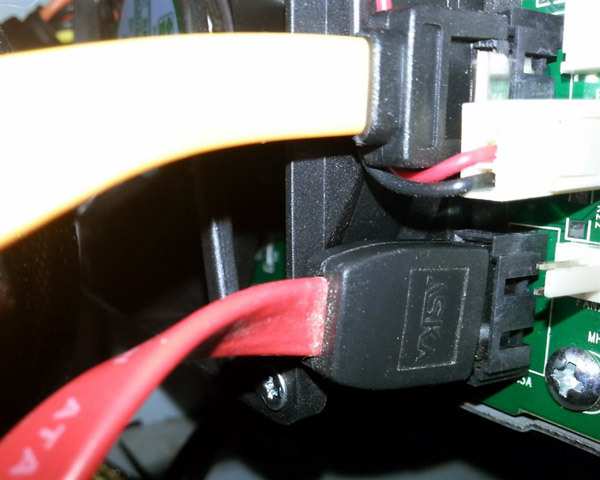 The tester can't follow this arguement, as ICY Dock guessed correctly, tend to have more S-ATA power connectors are available to current power supplies, but they are also just as often used. Often used power supplies such as the Be quiet! Pure Power L8 CM 430 Watts of the test system has 4 S-ATA power connectors. The S-ATA power connectors number in modern power supplies usually includes 4-8 piece. And these are then also quickly occupied by optical drives and HDDs. It would have been better maybe to use 4 pin Molex connectors as these are still available at almost any power supply but nowadays hardly used. Another problem of the S-ATA power connections is in the position. These are so close to the fan that many power supplies, where the connectors are perpendicula to the cable, it just does not fit or the have to be "choked on it". This probably sinks the livetime of the powercable and the connectors on the backplane. Another unfavorable positioning have the fan connectors. These are placed very closes to the S-ATA ports that you can only hardly unplug a S-ATA datacable with locking. And additionally the fan cable is under strong pressure. 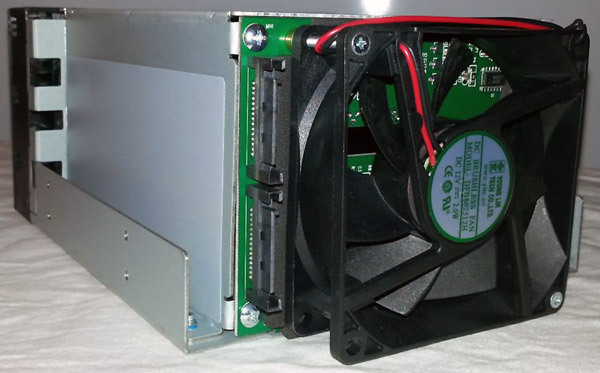 To keep the HDDs cool, a 80x80x25 mm fan is installed and the metal housing guarantees a good heat dissipation. 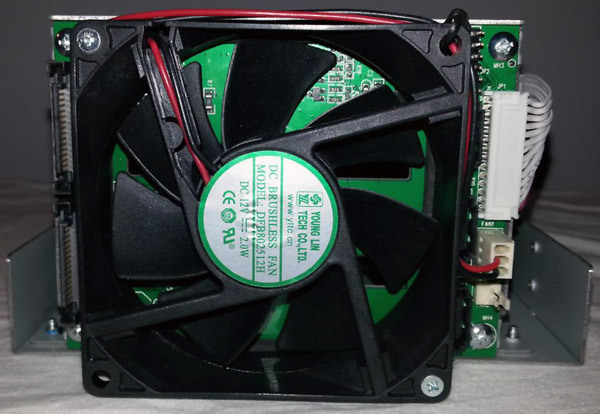 The fan can be replaced by almost every standard 2 or 3 pin 80 mm fan. 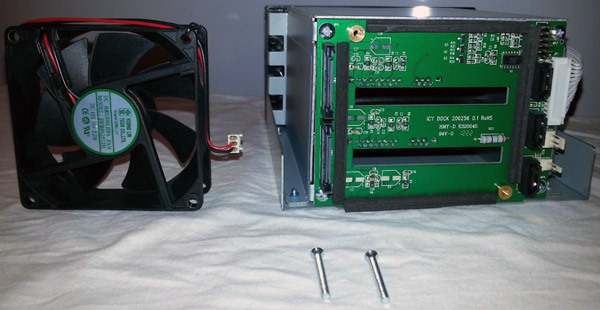 The fan is decoupled so that it does not transmit vibrations (maybe over the screws which are not decoupled) to the case. The air is sucked by the fan through the popenings of the disks, over and through the (very tidy) PCB, which has two more than sufficiently large sized vents. 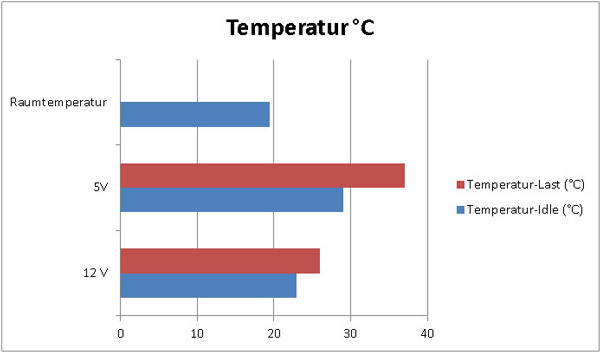 The fan keeps the hard drives all the time at idle cool on 23 °C (room temperature: 19.4 °C) and at 26 °C in continuous-load operation, but with estimated (the fan does not send a spped signal) 2000 rpm and it is unfortunately unbearably loud. The room has a silence value of 24 db(A) and the test system has without the ICY Dock Backplane a volume of about 27 db(A) at 1 m distance. By using the ICY Dock Backplane the noise leves increases to about 42 db(A), which is for silent enthusiats certainly not representing the optimum. Since the fan can be replaced or can even be operated by an external fan control on 5 V, the volume can be reduced drastically. 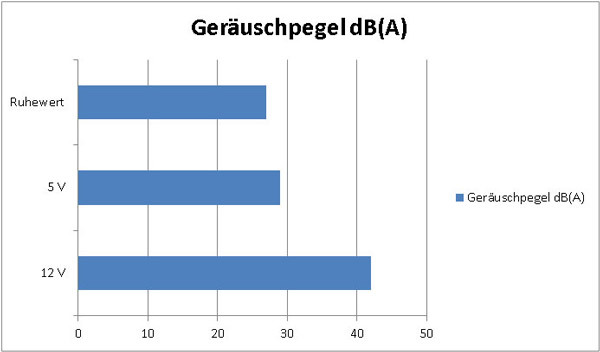 In this case the fan is clamped to 5 V and the volume dropped to 29 db(A). In an idle state the temperature rose to 29 °C and under load at 32-37 °C, but both values are still completely in the green zone, provided that the room temperature is not increased dramatically. 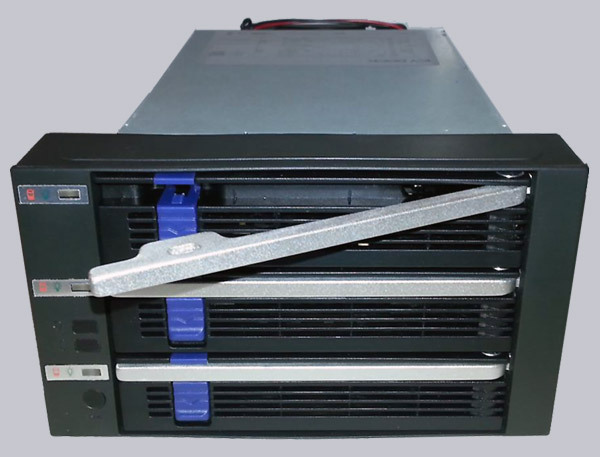 If the ICY Dock MB153SP-B is used in a Server, where volume is not so much of interest as cooled disks, then the fan chosen by Cremax is probably the best you could get. Another positive effect is, that the fan leads fresh air directly to the RAM, CPU coolers and, depending on the position, to the North-/Southbridge or graphics card. 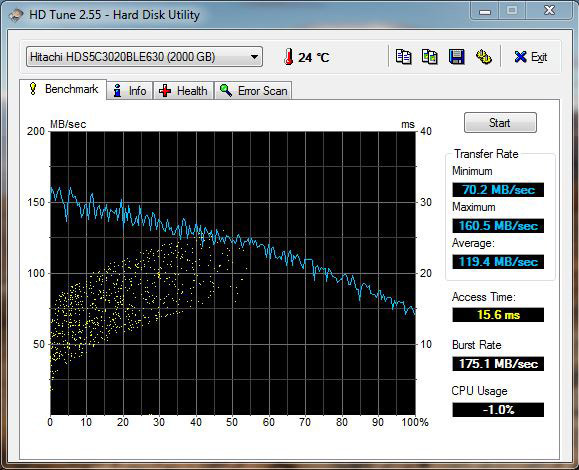 To test the transfer rate a Toshiba/Hitachi HDS5C3020BLE630 (2TB) with S-ATA III is used. The speed of the Backplane does not differ from "directly" connected hard drives. The ICY Dock MB153SP-B represents a basic backplane that does its job satisfactory all the way. The processing and the cooling concept speak for themselves, but, according to user or PC conditions, a few changes must be made. So you can slow down the fan by lowering the voltage to 5V and / or replace it, but this is done in a few simple steps. The pity is that there may be incompatibilities with some power supplies, but maybe you have some 4-pin to S-ATA adapters in your grab bag. It would be helpful if ICY Dock may enlarge the PCB slightly so that the connections do not have to be so bruised. 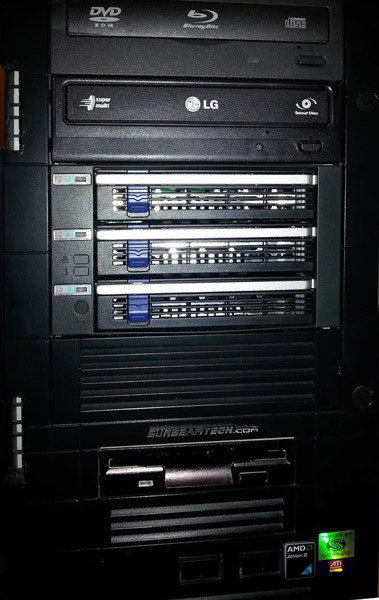 When one considers this, they could obtain with the ICY Dock a good S-ATA removable rack that meets everything what it has been expected of a removable frame: Cooled disks that are not slowed down and easily/fast exchange of HDDs. The Developer should think about the placement of the connectors. That could become a real problem, when the cables and the connectors are bend and squeezed like that for a long time.